In 2010 I worked closely with Maggie Murray and Michael Ann Mullen on a display celebrating the work of the Format Photography Agency. 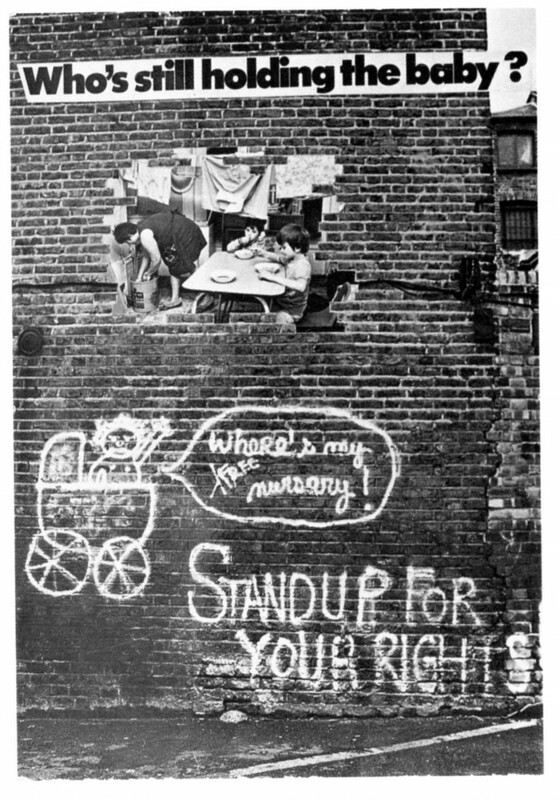 Both photographers were members of the influential photography collective Hackney Flashers, who between 1974 and 1980 produced bodies of work which focused on two key areas of women’s lives: paid work and the lack of childcare for working mothers. Their resulting influential exhibitions were ‘Women and Work’ (1975) and ‘Who’s Holding the Baby?’ (1978), and the latter was included in the Hayward Gallery’s first photography exhibition, Three Perspectives on Photography (1979). 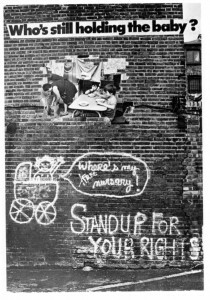 Now the Hackney Flashers have launched a website discussing their history and major projects, which also features slideshows of the collective’s photographs. To mark their fortieth anniversary and in collaboration with Photomonth, a special event will be held this Sunday 12th October, from 2-5pm at Chats Palace, 42-44 Brooksby’s Walk, London E9 6DF. In keeping with the theme of Communities, Collectives and Collaboration for the Brighton Photo Biennial 2014, Photoworks recently invited Liz Heron to write about her experiences with the Hackney Flashers Collective which you can read online here. From the project ‘Who’s holding the baby?’ (1978) © Hackney Flashers. This entry was posted in News, Photography and tagged Activism, Collective, Feminism, Hackney Flashers, Photography, Photomonth, Political, Women, Work.